An interface system with augmented reality technology could help people with profound motor impairments operate a humanoid robot to feed themselves and perform routine personal care tasks. Those tasks might include feeding and performing routine personal care tasks such as scratching an itch and applying skin lotion. The web-based interface displays a “robot’s eye view” of surroundings to help users interact with the world through the machine. Described in PLOS ONE, the system could help make sophisticated robots more useful to people who don’t have experience operating complex robotic systems. Study participants interacted with the robot interface using standard assistive computer access technologies—such as eye trackers and head trackers—that they already used to control their personal computers. The paper reports on two studies showing how such “robotic body surrogates”—which can perform tasks similar to those of humans—could improve the quality of life for users. The work could provide a foundation for developing faster and more capable assistive robots. Grice and Charlie Kemp, professor in the biomedical engineering department at Georgia Tech and Emory University, used a PR2 mobile manipulator for the two studies. The wheeled robot has 20 degrees of freedom, with two arms and a “head,” giving it the ability to manipulate objects such as water bottles, washcloths, hairbrushes, and even an electric shaver. “Our goal is to give people with limited use of their own bodies access to robotic bodies so they can interact with the world in new ways,” Kemp says. In the first study, Grice and Kemp made the PR2 available across the internet to a group of 15 participants with severe motor impairments. The participants learned to control the robot remotely, using their own assistive equipment to operate a mouse cursor to perform a personal care task. Eighty percent of the participants could manipulate the robot to pick up a water bottle and bring it to the mouth of a mannequin. 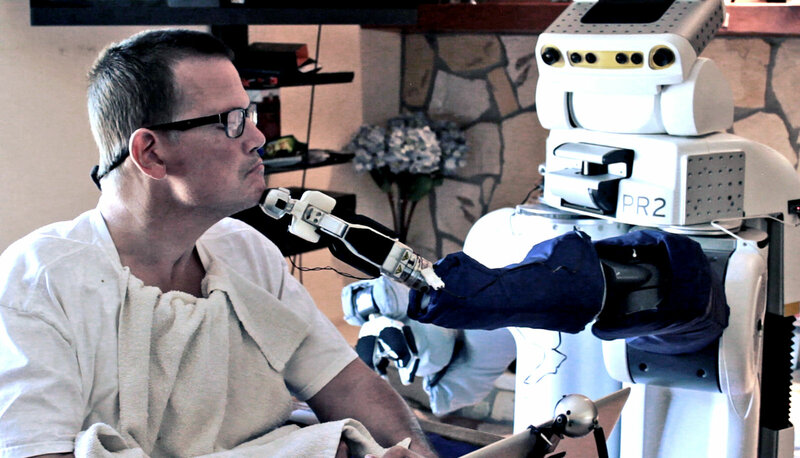 In the second study, the researchers gave the PR2 and interface system to Henry Evans, a California man who has been helping Georgia Tech researchers study and improve assistive robotic systems since 2011. Evans, who has very limited control of his body, tested the robot in his home for seven days and not only completed tasks, but also devised novel uses combining the operation of both robot arms at the same time—using one arm to control a washcloth and the other to use a brush. The way Evans developed new uses for the robot, combining motion of the two arms in ways they had not expected pleased the researchers, Grice says. “When we gave Henry free access to the robot for a week, he found new opportunities for using it that we had not anticipated. This is important because a lot of the assistive technology available today is designed for very specific purposes. The interface allowed Evans to care for himself in bed over an extended period of time. “The most helpful aspect of the interface system was that I could operate the robot completely independently, with only small head movements using an extremely intuitive graphical user interface,” he says. The web-based interface shows users what the world looks like from cameras located in the robot’s head. 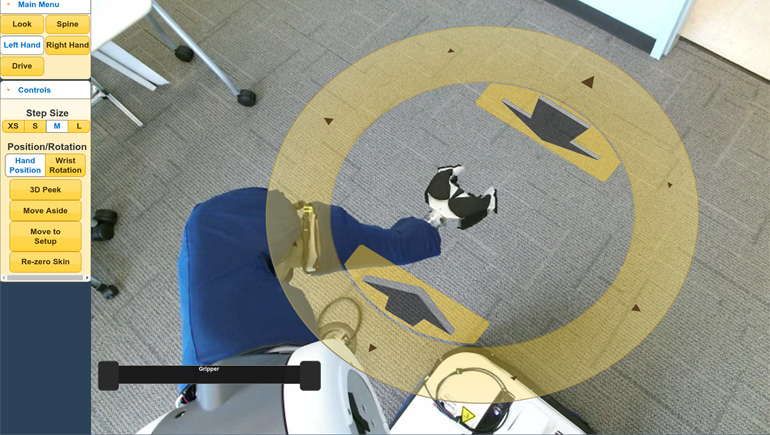 Clickable controls overlaid on the view allow the users to move the robot around in a home or other environment and control the robot’s hands and arms. When users move the robot’s head, for instance, the screen displays the mouse cursor as a pair of eyeballs to show where the robot will look when the user clicks. Clicking on a disc surrounding the robotic hands allows users to select a motion. While driving the robot around a room, lines following the cursor on the interface indicate the direction it will travel. “Having an interface that individuals with a wide range of physical impairments can operate means we can provide access to a broad range of people, a form of universal design,” Grice notes. The developers will need to make significant reductions in cost and size to make the PR2 commercially viable, Evans says. The studies point the way to a new type of assistive technology, Kemp adds. The National Institute on Disability, Independent Living and Rehabilitation Research, the National Science Foundation, and the Residential Care Facilities for the Elderly of Fulton County funded the work. Willow Garage made the robot. Kemp is a cofounder, a board member, an equity holder, and the CTO of Hello Robot Inc., which develops products related to this research. This research could affect his personal financial status. Georgia Tech has reviewed and approved the terms of this arrangement in accordance with its conflict of interest policies.